We expect the work to be completed in 2 hours. Blackboard 9.1 will be undergoing scheduled maintenance on Friday, 30th January, between 11:00 pm and 05:00 am. You may experience some intermittent service interruptions. 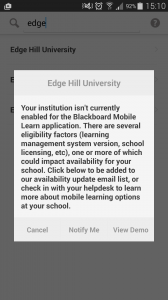 Access to the Blackboard Mobile Learn app has been restored. We apologise for this short disruption. If you have any questions, please email us on ltdsupport@edgehill.ac.uk or call us on 01695 650 754. 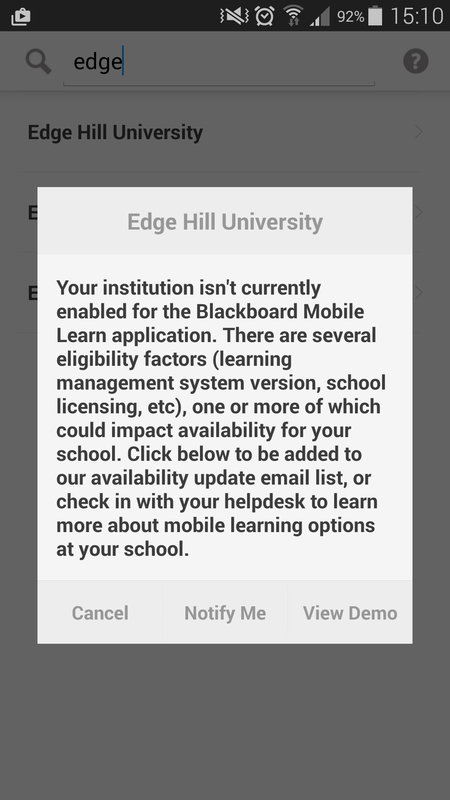 The Blackboard Mobile Learn app is showing an error suggesting we don’t have Blackboard Mobile Learn app enabled. We are working with Blackboard to resolve this issue and hope to have service resumed asap. Thank-you for your patience. LTD will keep you updated with any changes to the service via this blog. On Friday, January 09th, 2015 between the hours of 01:00 am to 05:00 am CET, the Blackboard engineers will be performing an infrastructure maintenance. This maintenance is not expected to be service impacting however we are notifying you just in case you experience any intermittent connectivity for few minutes during this maintenance window.